One of the things that D and I lament is that now that we have such specific food requirements, our invitations to people's houses seems to have dropped a little. So it is always with much joyful anticipation that we accept offers to hang out with people, especially people we like as much as we like Gilli and Dr Greg! We were treated to a wonderful three courses of mostly home-made delights. 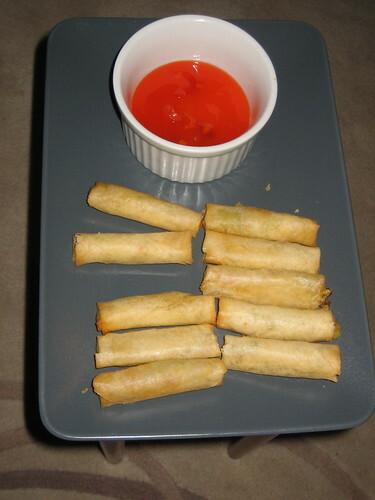 We commenced with spring rolls (not homemade) as we sat around and chatted. 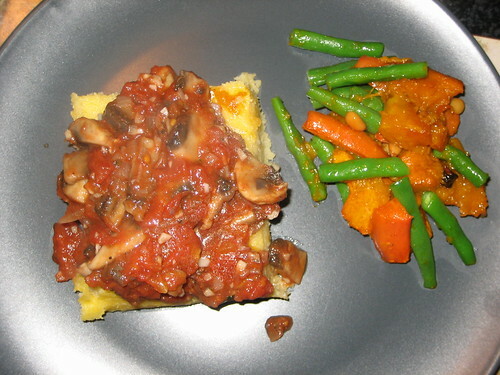 We migrated towards the table and continued on with baked polenta and a mushroom ragout. The polenta was very interesting, I've not had baked polenta before and I was intrigued by its sort-of solid consistency. It seems like the sort of thing that likes to soak up liquid. The mushroom ragout was awesome. This was served with a side of their amazing roasted salad, featuring roasted pumpkin and fried pinenuts (which were so good). 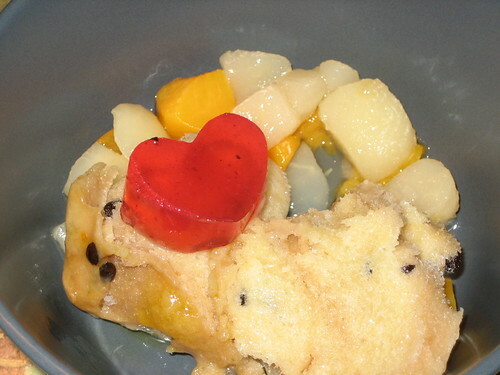 We rounded the meal out with berry agar-agar jelly hearts, two-fruits, and a delicious banana and passionfruit sorbet made by Gilli. I love homemade sorbet, it is awesome. I particularly liked the hearts - more foods should be great shapes! It was a great night out, I love visiting friends! In between courses we paused for chats, tea, and board games. We played a game of Blokus (which I won) and a game of MOUSETRAP. It has been years since I've played Mousetrap, so that was a bit interesting. The game itself is sadly not as engaging as I remembered, perhaps because I am now much older than I was when I coveted it. We're definitely giving soups a lot of consideration this winter, which is lots of fun. It involves lots of making toast soldiers, and carefully balancing my bag with my lunch leftovers on the bus in to work. 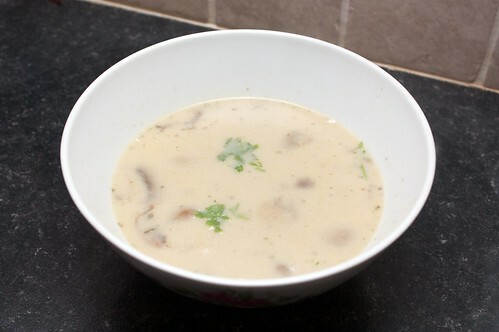 D gave the cream of mushroom soup from Soup for All Seasons a go this week, it involves a whole bag of mushrooms and a lot of stirring. The end result was not quite as creamy as we might have hoped, you'd do better to add a little less stock (certainly not the full six to eight as suggested in the recipe). Also the giant pieces of mushroom were not quite my thing, though the flavour of the soup was quite nice. Will give this one another go sometime, perhaps with some slight modifications. I would want to cut the mushrooms a little smaller, perhaps pulse it a little just to mush it the tiniest bit. D rates this soup delicious. I’ve grown up calling a lot of things by a lot of different names. I say yao chao guai, but I also say you cha kuih, and most often I say 'crunchy stuff.' There was that time in the car when we kept talking about gula, and try as we might we couldn’t remember what it was in English. This mixing of words comes from being from Penang, where the town is quite Hokkien but my family is Cantonese and of course it’s in Malaysia and most people speak English. 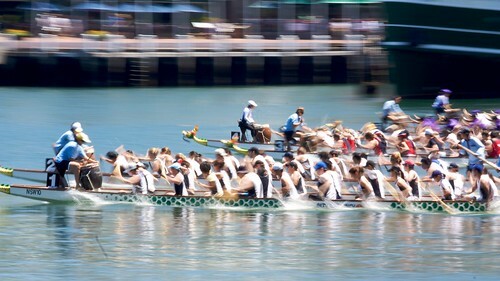 Today is Duan Wu Jie, or the Rice Dumpling Festival, or the Dragon Boat Festival, or 端午节, or double fifth. On Duan Wu Jie, we make ba cheng, tie it up and hang it up, and then throw them in the river. I buy my ba cheng, and I eat it all up, no river-throwing for me (but also no dragon boats). The idea is to ward off bad health and things, and it’s either a commemoration of this old advisor, whose body was protected from fishes by zong zi in the water, and by the rowing and beating of drums, or it is part of the Madame White Snake mythology. 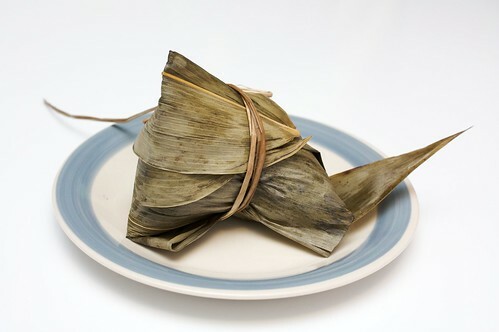 Ba cheng is also zong zi, it’s usually wrapped in lotus leaf but a variation for us heathen South-East Asians is banana leaf or pandan leaf. Ba cheng is glutinous rice with a tasty filling, mushrooms or chestnuts or red bean paste or an assortment of things. My favourite filling is mushrooms, chestnuts and fake chicken, a hold over I suppose from my childhood when my favourite filling was chestnuts and chicken (I like mushrooms a lot more now than I did then). These ba cheng this year are from Lotus, I steamed them in the leaves for ten minutes before unwrapping and nomming. Having taken quite a few lemons, I did not only bake the delicious lemon and passionfruit curd cake, I also baked some super delicious lemon and poppyseed cupcakes. I used the same recipe I always use, because it has long stood me in good steed. And is delicious. 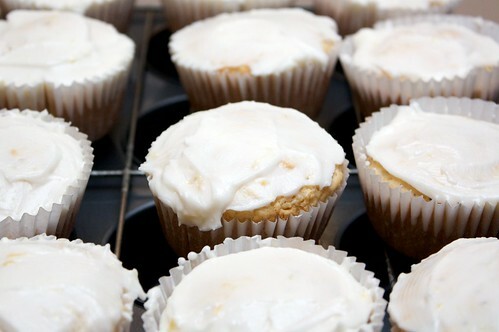 D iced them, adding some lemon rind to it for a very delicious and beautiful icing job. There were some free lemons floating around at work last week, so I nabbed a couple of them and tried out this lemon and passionfruit curd cake recipe by wanting kneading. This cake was so delicious, there is an export embargo on it, it is not to leave this house. It is so good! The only change I made to the recipe was to use applesauce instead of no egg/egg replacement powder. I'm wondering if this made the cake slightly heavier than it should have otherwise been, but it made no notable difference to deliciousness. I baked it for about fifty minutes. 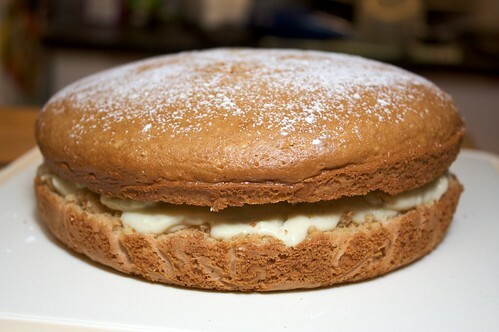 I am definitely going to make this cake again. Friday was all gross and cold and windy and rainy, weather which dictates the use of the oven to slowly warm the house. We've really been getting into the pasta bakes lately, so I decided to try making up something new, but similar to the stuff we used to eat pre-veganism. Put the spirals on to cook. When they're done, drain and set aside. In a pot, add some olive oil, and the dried herbs, pepper and garlic. After a minute or two, carefully not burning the herbs, add the tomato, combine and leave to simmer, lid on, for fifteen minutes, until reduced to mush. You may need to stir occasionally, and add a little liquid as required. I usually end up adding about half a cup or so. In the meantime, slice and fry the mushrooms in olive oil. At the end, add the spinach, and stir to wilt. Set aside. In a bowl, combine tofu chilli flakes, savoury yeast flakes, and soy milk, and mix well until it's mostly liquid with relatively few lumpy bits (a few lumps are okay). 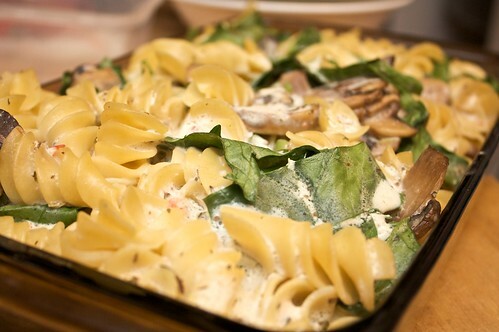 In an appropriately sized baking tray, combine tomato sauce, mushrooms, spinach, pasta spirals, and olives. Mix well. Pour tofu mix over the top, and gently stir through, leaving most of the tofu still relatively near the top. Bake at 175C for 15 minutes. Part of our ongoing mission to discover the perfect pad thai recipe, we gave the Thai stir-fried noodles from The Asian Vegan Kitchen a go during the week. You can find the recipe on page 124. These noodles were not difficult to prepare, and we had to leave out the tofu, radish and beansprouts as we were sadly lacking them. I substituted plain rice vermicelli for the sen lek, even though I later discovered I had some sen lek hiding behind the rice bin. This dish was spicier than I expected it to be - I expected it to have no bite, as it contained only one teaspoon of cayenne pepper, but that was sufficient to add quite a good spicy bite to the noodles. This was a good dish, but not quite the noodles dish that I was expecting, so our search for the perfect pad thai recipe continues. I'm not a huge fan of buying my lunch, it's difficult to get something decent and vegan. The IGA down the street sells some of those Gourmet Cookies vegan pasta dishes, but some days you don't want to go for a walk only to be disappointed by an absence of food. So Monday night after getting home late, I whipped up an emergency mee for lunch on Tuesday. I've blogged about maggi mee before, this is quite similar to that with a few alterations to make it more Singaporean mee than Malaysian maggi mee. 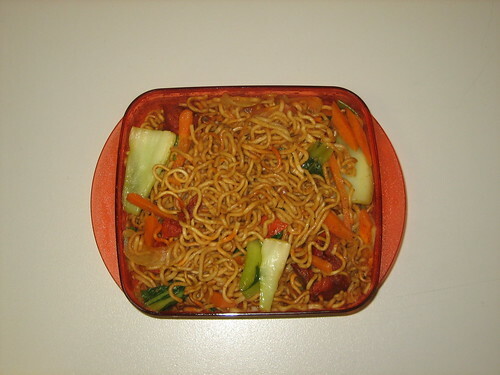 An awesome breakfast meal or afternoon snack, a quick mee can be made in about twenty minutes mostly with things on hand, but an onion, some curry powder, and some light soy are essential. Soak the noodles in some hot water for about five minutes. Drain and set aside. Slice the onion into wedges, and break apart. Jullienne the carrot. In a wok, heat a small amount of peanut oil, then fry the onions and the carrot for three or four minutes. Add the garlic clove, the curry powder, and the dark soy, and stir to combine. Add a tablespoon or two of water, and put the lid on the wok. Leave to steam for five minutes, then add the stems of the bok choy, and put the lid back on (having added some more water if necessary). Steam for three minutes. 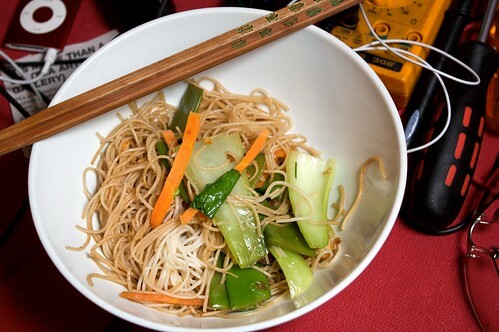 Throw in the noodles, the rest of the soy sauce, the leaves of the bok choy, and the pepper, and any of the extra things you might be adding. Toss through, and leave to sit for a minute or three, tossing occasionally (the noodles may stick to the wok, so keep an eye on them). If you are using dried mushrooms, remember to soak them in hot water for five or ten minutes before hand, and add them about the same time as the bok choy stems. I used to really like pasta bakes, but have sort of wandered away from them since we went vegan, mostly because of the lack of melty cheese to add on top. 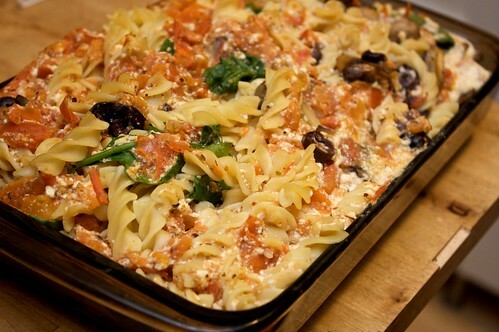 So I was intrigued by this pasta bake recipe by Earth Vegan. I modified it a bit, but my recipe was quite strongly influenced by that recipe. This does not reheat very well the next day, though it is doable. Prepare the pasta. Blend together tofu, milk, yeast flakes, chilli, mint, garlic and cumin. You may wish to slice the chilli before adding it to the blender. Blend until well combined. Slice and fry the mushrooms. Tail and slice the beans into thirds, and add to the pasta to cook when there are a few minutes remaining for the pasta. 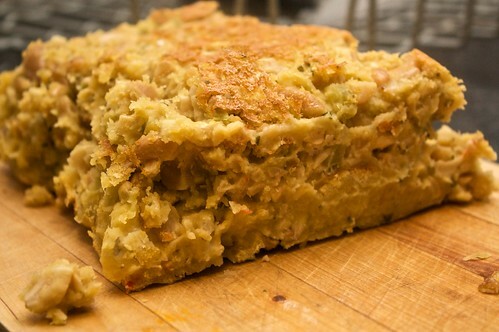 In a baking tray, combine pasta, spinach, beans, peas and mushrooms, then cover in tofu mixture. Ensure that everything is covered by the tofu. Bake at 175C for 15 minutes. Had to help D's brother + sister-in-law move on Saturday. I wasn't sure what our movements would be re: food, and I had a very overripe banana in the fridge, so on Friday night, after getting back from the cinema, I attempted some banana bread. 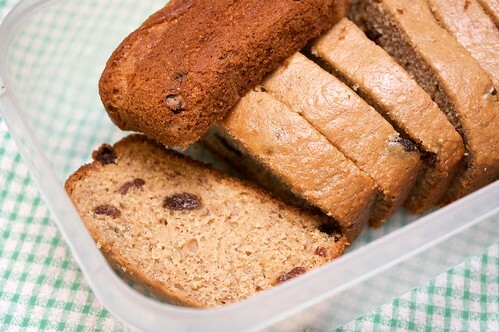 It ended up more like cake than bread, but made a great on the go snack the next day, in between voting, heaving lifting, and throwing things into boxes. Sift together the flours with the cinnamon. In a separate bowl combine the banana, sugar lemon juice, apple sauce and milk, and then mix into the flour. Add the sultanas, and keep mixing until well combined. If it seems a bit dry after five minutes, add a tiny bit more milk. Line the base of a bread tin, and grease the sides. Pour smoothly into the tin, and bake at 180C for 45 minutes. I've been a lot under the weather, so on Monday we delved into Soups for All Seasons for some nourishing soups. 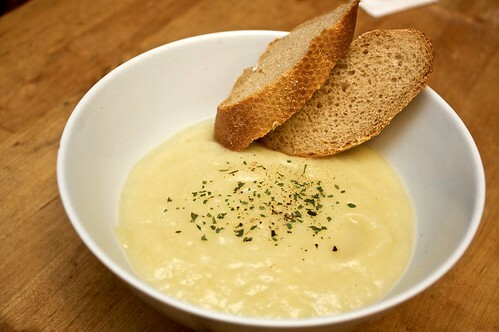 We made the leek and potato soup. It was creamy and delicious, though D found it a little bland. I was okay with this, as I wasn't feeling fantastic by Monday night. The soup was also a little bit stringy. If we made it again we would cut the leek into rounds, rather than into lengths - the text was not specific, and I just chopped the leek the way I usually would, into lengths. Overall, though, it was a very satisfactory experience. 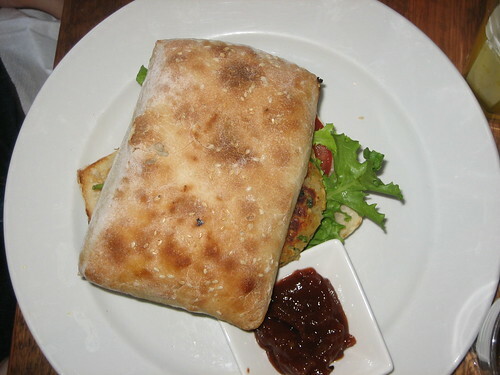 We served it up with some sourdough baguette, of which, it turns out, I am not actually fond. 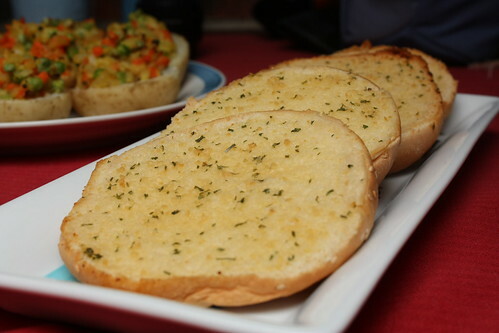 I love a good garlic bread, with a crisp crust and soft, perfectly-cooked insides. The proportions of garlic to margarine to herbs are different for everyone, but it's so important that they're juuuust right. This is how D and I like to make it. Mix together the garlic, nuttelex and parsley, until well combined. Leave to sit for ten to fifteen minutes. Cut the buns in half, and spread thickly on cut side with the garlic butter. Bake at 160C for about 15-20 minutes, or until crispy but sort of soft. Serve as as side or a snack. This is a great way to use up some of those one or two remaining buns from when you end up buying a six pack. 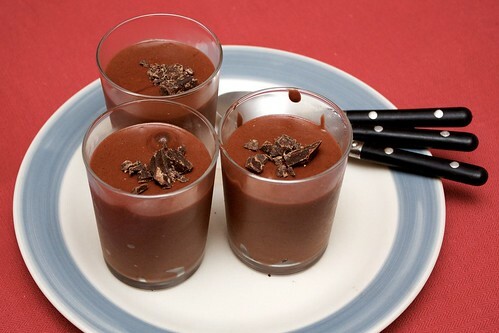 We had a friend over for dinner last week, and we didn't want to have yet another meal with no dessert, so we rummaged around in the pantry and found a packet of Orgram Chocolate Mousse. We cut it with triple sec, and chopped up some chocolate-orange pieces which we added to the bottom and sprinkled on the top. It was pretty awesome! I love the Orgram stuff. We were super excited to make pizza from scratch on Tuesday - we made our own pizza base, and our own pesto, and it was the greatest pizza we've ever eaten. I was so excited, I want to do it again soon! The pizza base cooked light and soft, and it was so delicious. It was uncomplicated to make, and didn't need that long to rise, and now that I've had homemade pizza base I'm not sure I want to go back to store bought. Combine tomato paste and garlic, and spread thinly across pizza base. Thickly spread the pesto on top. Don't spread all the way to the edge - leaving some gap helps the crust rise and form and be delicious. Slice the roma tomatoes so they are circles, and place around and across the pizza. 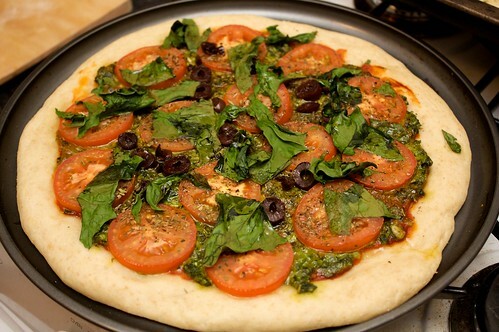 Cover with some olives and spinach leaves, and drizzle the olive oil over the top. Bake in the oven at 200C for about 20-25 minutes. pound together half a bushel of shredded spinach leaves (not the stems), with a large handful of pinenuts, and a lot of olive oil. 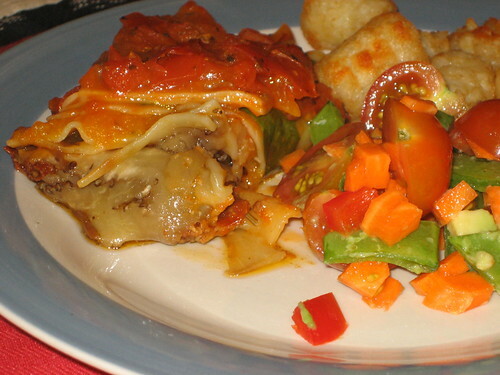 loosely adapted from Charmaine Solomon's Complete Vegetarian Cookbook, whereby 'loosely' I mean D was very approximate in the measurements and times and things, but the ingredients are the same. Sprinkle yeast over water, leave for a few minutes, then add sugar, stir to dissolve. Sprinkle a teaspoon of flour over the top and leave it for 10 minutes until it froths. Put flour and salt into a bowl, add yeast mix and oil. Beat with a wooden spoon, then knead for about ten minutes. Oil a bowl, put ball into bowl, move around so the ball is oiled. Leave for an hour to rise. After it has risen, punch it down, then roll out (or attempt to spin out). Makes one big base. I have a picnic obsession, and even though this country is covered in ants and bugs and flies and spiders and things that like to crawl over the picnic blanket (mostly ants), I am not ashamed to admit it. So have another picnic post. Put the risoni on to boil in some water, for about five to eight minutes. Drain. Meanwhile, combine lemon juice, chilli, vegie stock, garlic and pepper to form a sauce. 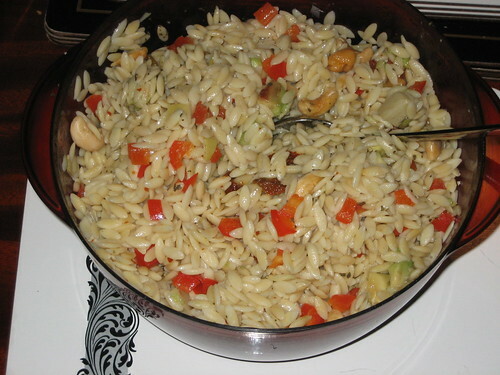 Mix together cooked risoni, sun-dried tomatoes, artichoke, olives, capsicum and snow peas, as well as the lemon-chilli sauce and the reserved oil. Toss to combine. Crush the cashews roughly, or toss them in whole. Today is a beautiful Autumn day here in Perth, 27C as I type this and nice and warm in the sun. Although by early May we've usually shifted into slightly cooler weather, it's a little behind this year and we've been taking advantage of this by going on picnics where possible. 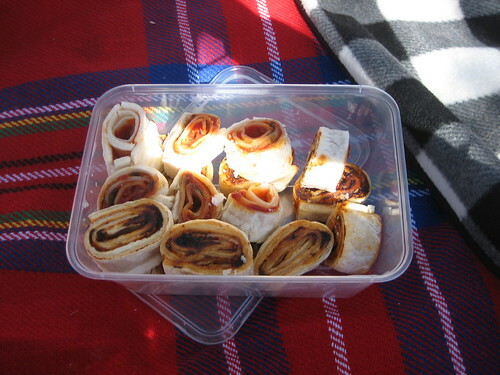 This is a super fast and very easy picnic idea for your next picnic. It was actually my first try making them, and I'm very happy with how they turned out. Plus, picnics! How I love them. Grab a sheet of puff pastry, smear with tomato paste all the way from the end closest to you, across the edges, and leave about a centimetre of pastry free of paste at the side away from you. Shake over oregano, and some fresh basil and pepper, quantities to your preference. At this point you can roll it straight up, or add some artichokes or something that rolls. Roll it up, starting with the side closest to you, not super tight but still quite compact. Leave to sit in a roll in the fridge, and continue with another sheet. After the roll has been in the fridge for about ten minutes, cut through the roll into about eight pieces. Place on a baking tray flat, that is with an open end facing up and the other facing down. Bake, single layered, in the oven at 150C for ten to fifteen minutes, or until the puff pastry has started to puff. You may need to flip them halfway through. Eat hot or cold. Our friend Caro is in Perth at the moment, and delightfully she brought with her 'A Taste of Mexico,' a vegetarian cookbook. As regular readers of this blog will know, I have a slight obsession with Mexican food, borne of Australia's lack of available Mexican food. So last Friday I flipped through the book and found some interesting recipes, and then modified them a bit as we went along. 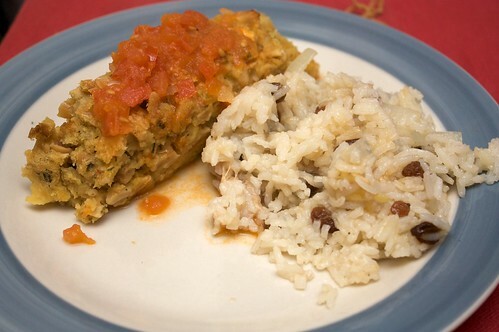 This lentil and nut loaf is super delicious, and the sweetness of the rice was pretty awesome, too. Heat the oil, saute the onion, celery and chillis for five minutes. Add the lentils, stir, and add three cups of water. Bring to a boil, then lower and simmer, lid on, for 40 minutes. You may need to add a little more water. Add the parsley, nuts, bread crumbs, soy sauce, and salt, and combine. Mix well. Line a bread pan (13x23 ish cm) with foil, and fill with the lentil mixture. Cover, and bake for 45 minutes at 175C. Saute the onion in some oil until golden, then add the tomato. Simmer over low heat with the lid on for twenty minutes, then add the bay leaf, salt and pepper, and a little bit of water, then continue to simmer for another twenty minutes. When the nutloaf is finished baking, leave to stand in the pan for five minutes before removing. Leave to cool another five or ten minutes before cutting. Pour the tomato sauce over the top. Saute the onion and garlic in the oil for five minutes. Add the rice and saute for ten minutes, then add everything else, and bring to a boil, before reducing the heat and leaving to simmer for twenty minutes. I tend to do all of the Malaysian cooking in our kitchen, so last night D gave a first attempt at making laksa, and it was awesome. 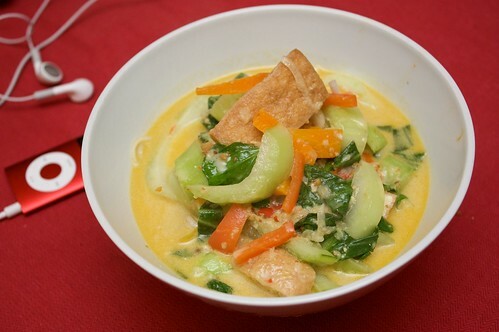 D used my usual laksa recipe, which I have blogged about previously. I assisted by de-tailing the bean shoots, a suitable assistant task, and by later making choc chip and banana cookies. The noodles used were a combination of yellow mee and rice vermicelli, and D also included some tofu puffs sliced into quarters. Om nom nom! We made an order to Tea Party late last Thursday, and they arrived this morning! I am so jealous that D is at home, sipping delicious new tea, and I am stuck at work with only mango sencha and some oolong (kuan yin type) for company! 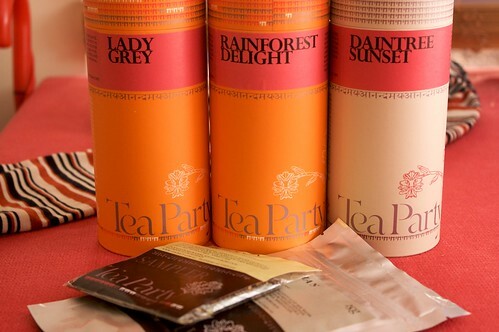 Both are delicious, and Kuan Yin oolong is my favourite, but I would love to try some of that Daintree Sunset. This was inspired by Michael's post about eggplant lasagne rolls. Rolling seems like fun but the idea of all that condensed eggplant and oil in one place was a bit much for me, so I modified it a bit. This looks a bit fiddly but it's quite straightforward, took about an hour and a half from go to nom. I found it quite rich, so for me it made six serves. Peel the eggplant and slice it thinly, really really thinly. Salt both sides with a lot of salt, and leave to sit for ten minutes. Then start frying the eggplant, in lots of olive oil, until each side is browned. Drain and pat off the excess oil. Peel and deseed the pumpkin, then cook and mash. Meanwhile, was and roughly chop the half a bushel of spinach. Pound together half a cup of pinenuts, with a handful of spinach. Drizzle olive oil into the mortar as required. Dice the tomatoes. In some olive oil, fry the oregano, marjoram and basil. After a minute, add the tomatoes and the tomato soup, as well as the salt and pepper. Reduce the heat, and leave to simmer for half an hour, stirring occasionally, until the tomato has reduced to a sauce. Spread a thin layer of the tomato sauce across a square pan, carefully covering the entire base. Layer two lasagna sheets (or however many you require to cover), and spread the pesto evenly across these sheets. Place a whole lot of eggplant on top of the sheets, reserving three or four slices if you can. Drizzle a small amount of tomato sauce across the eggplant, and layer two more lasagna sheets on top. Spoon the pumpkin onto this layer. Layer another two lasagna sheets, and spread some of the tomato sauce across the sheets. Throw in the spinach, cover with tomato sauce, and cover with two lasagna sheets. Spread the remaining eggplant atop the sheets, and pour the remaining tomato sauce over the whole thing. Bake at 210C for 40 minutes. This was fairly oily, so it was refreshing to serve it with a fresh salad (and some potato gems). This is the last Melbourne post for this trip! Spent the night in Castlemaine at a delightful B+B run by two old dears. Castlemaine has all sorts of fun stuff, like the Restorer's Barn, filled with steam-punky delight and a room entirely filled with cups and saucers. There is also an awesome toy store, lots of nooks and crannies full of stuffed and wooden toys and things, and a cool environmental shop! But we were in Castlemaine to visit a friend of mine, so we met her at Saff's, upon her recommendation. For lunch D had the dahl burger, which was quite tasty, and came with a scrumptious relish. 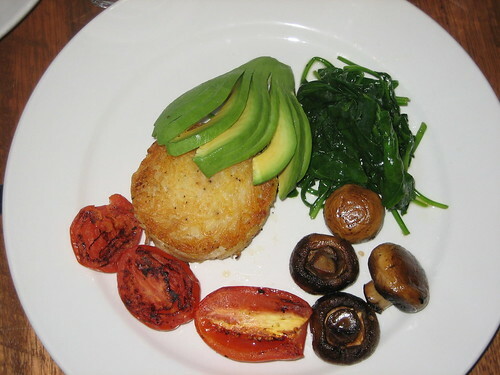 I had the vegan + gluten free breakfast, with an awesome potato rosti. Their hot chocolate was also pretty delicious. Later, we found ourselves wandering, wanting dinner, and we remembered some fairly tasty things on the menu we hadn't tried, and we couldn't be bothered trying to locate somewhere else that was vegan friendly, so we went back and tried the pumpkin risotto and the vegetable curry. The risotto was quite strong and flavoursome, but I preferred D's curry, with quite subtle flavours and not too much of a creamy texture. If you're in Castlemaine, I totally recommend Saff's. Also they're open late, which is awesome.